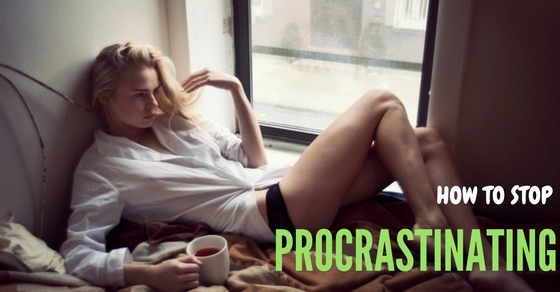 As funny as it sounds, procrastination is a very common problem to most of us. Procrastination can be defined as a process of delaying important priorities and processing less important things. As a fact, this term is very common in term of experience. Well, that is because the majority of us do suffer from prolonging lazing syndrome. Prolong lazing syndrome is undoubtedly not a big disease; however, it definitely ruins a lot of things for you (consciously or unconsciously). Therefore, there are many consequences that you have to face due to this little bad habit of yours. However, you need not worry for, as there is a miraculous tonic that might help you overcoming procrastination syndrome, as we all know most of the things are in our mind. So let us look through some steps that will help you conquer ‘procrastinating syndrome’ or how to avoid procrastination with great success. The following mentioned are few productive procrastination tips on how to overcome procrastination and the different causes of procrastination. Now imagine that you are assigned a task. The task includes making a huge ocean. What a tedious task! Of course, it is just a turn off right away. The intensity of the task just ruined the entire motivation altogether. However, what happens if you are allowed to break the task into smaller parts. Divide and rule will definitely work here too. Divide the quantity of your task and rule the project (meanwhile destroy every bit an inch of procrastination cells in you). Of course, dividing a task of ‘ocean’ may also seem like a big deal. However, you need to start from somewhere. Let us take a more related example to simplify this. As an employee, you regularly are assigned some or the other work. However, procrastination can simply result in loads of work for the week. Divide the task in smaller part and get your work done every day. For example, decide to give 10-15 minutes in studying the project, divide the next 10 minutes in deciding your techniques. Once you start your work, there is nothing stopping you from completing it (not even procrastination). Workplace is the most important thing. It can attract you or disgust you. It can motivate you or turn off every ounce of motivation of you. It can matter a lot. Therefore, it is the utmost necessity that the place you work in should be free of anything that might disgust you. Workplace or your work desk should be a place that you look forward to every day. The best way to deal with any kind of procrastination at work is by changing the environment around you. Give a face-lift to your environment right now. (2) Cleaning the closet / rearranging the closet by 8:40am. This will help you be active and get done with the work. More frequent deadlines are another key that activates urgency of the act. Specifying date and time is very important. ‘Procrastination generators’ seems like a very big thing. On the contrary, procrastination generators are those elements or things that make you feel lazier in doing any specific task. Start identifying these generators first. For example, WhatsApp messages, Facebook notifications, Newsletters and blog mails, Instagram, YouTube, Television etc. The biggest procrastination generator is our social media itself. As soon as you discover your procrastination generators, try to find solution to deal with it. Going to an extreme level where you delete all the possible applications is of course not an ideal way. However, on thinking well we can figure out some or the other way to lessen the effect of these applications. Fighting procrastination is like making ourselves aware of our conscious actions. One can turn down the notifications of all the pings and messages. This will stop all those applications from being a distraction. Of course, that is another drastic and extreme method. You cannot change the company or the people you hang out with on everyday basis at once. However, it is also important to look into the influence those people have on you. If they are lazy or chronic procrastinators then you are bound to be one too. You need to have people who are go-getters or hard workers. They are the people who would inspire you to work and help overcoming laziness. Apart from that, you can also make a habit to read one inspiring quote or blog against chronic procrastination every day. This will also work as an inspiring factor. However, make sure that you do not end up surfing online while reading these quotes. Keep your focus straight. People are the funniest creatures on the entire planet. Once they know about something, they will make sure to keep inquiring about the same thing. For example, tell them something about a task that you are about to complete or are planning to do. Of course, not about throwing garbage but about some tasks that are very long or time consuming. Time consuming tasks are the ones that face the wrath of your procrastination cells. Once you inform them about your task on your personal blog, twitter tweet, Facebook posts, Whatsapp statuses, etc. Then enjoy the continual reminders of the followers and friends regarding the on-going progress of your task on a regular basis. They are indeed better alarms (which cannot be snoozed no matter how many times you try). People with same goals can be a great motivation for you. Do you not think so? Making plans and to-do lists is very easier but following those plans can be tougher than you have thought. Ah that just killed your motivation. Well, I am sorry for doing so; however, that is the cruel and bitter truth. You need some kind of regular motivation to complete. Let us improvise point #6. Apart from telling the entire world about your plans, what do you think about sharing it to one of your friends with the same goals? Competing can be another way to conquer the envelope of procrastination over oneself. On the other hand, also remember that competition should always be in high spirit. Compete and help each other achieve the best in life. Linking us with someone who has already achieved similar goal is the best way to destroy the walls of procrastination. Sometimes you keep putting off your work because they seem a lot harder and you lose all your possible motivation. Now when something as such happens you can approach someone who has already been in your place and experienced everything that you are at present. In this world, ‘www.’ is the best place to search for these people. Start searching now and hopefully you would get some people soon. We all are completely in love with any kind of reward that turns up in our way. Rewards are great motivators and can be given on completion of a task. If procrastination is a disease then reward is one of the most effective medicines of all times. Whenever you are bound with the completion of a task, think of a following reward at the end of a task. Give yourself a treat or make yourself something good or even gift yourself a thing of your choice. This can also be called reinforcements. There are two kinds of reinforcements that can help in getting a task completed in a given period of time. Use positive reinforcements in the form of gifting you on completion of a task. If that fails to work then start using negative reinforcement. Negative reinforcement can be put to work by taking away one of your favorite things on not completing a task in given period. For example, cutting short on the time spend for entertainment like games, movies or coffee parlors. Employees generally have a long term task or goal of being promoted to the superior position. These goals may take a lot of time. During the course of this task, there may be several mini tasks. These tasks may simply have no effect on the larger goals. That is when procrastinating cells are at their highest. They prevent you from even touching the subject file. There is almost no motivation. Those are the periods when you need to carefully understand the objective of the task you are about to perform. Once you understand the objective, it becomes easier to understand the reason of the task. If the task still seems less likely to make a difference in attaining the overall goal then think of another way to get it done. You have already heard about the regular method of rewarding i.e. positive and negative reinforcements. Another form of reward is break rewarding. Now believe me this is one of the most effective technique. Even during a school seminar, we were told to prepare for exam in this manner. Study for 45 minutes and take a 15 minutes break. That is the exact technique used for fighting procrastination syndrome. Concentrate on your goal and keep working on it. However, after a while our human mind needs a break. Reward yourself with a reasonable break of 5-10 minutes in an hour or more. Tip: Make sure to not increase the break schedule and procrastinate the work altogether. If you are the perfectionist then remember you are never going to complete things in the given period. Acquiring perfection requires various elements that are not always available. You can expect a perfect end result; however, you cannot expect perfect elements to begin with at any time. Waiting for perfection is another term for procrastinating a task altogether. Instead, you should ditch the thought perfection and concentrate on achieving better results. Consider the quality of your task and the list of things on your notepad. If you still feel like the task is too hard, move onto the next task on the list. This way you would get done with your task. Get back to the original task when you feel that you have done the other remaining tasks. Consequences can make you realize that deal with your task. For example, when your wife asks you to discard the garbage, the underlying threat is that if you do not complete this task then you might have to face her wrath or may an argument or two. On a similar note, if you do not complete an office task then you might get demoted or worse fired from the organization. Keep yourself in check with the consequences. 14. Just do it already! Well, you may divide the task, reinforce yourself with positive and/or negative reinforcements, give yourself breaks, plan and strategize your project, think of a brilliant idea, etc. However if you do not get into action then everything is useless. Reality check: Not a single successful and rich person out there is a procrastinator. They are hardworking, dedicated, goal-oriented people. Therefore, if you do not take action you would never be able to get anything done. Get on your feet and start planning your work. Be an active person and complete your tasks. Not everything will give you a fruit right away. At times, the required result may appear quite later than expected. However, you should not stop for a second. If you do stop then remember the web of procrastination is right behind you ready to take you into their possession.